On this 72nd Anniversary of D-Day, we’d like to share these interview transcripts. As part of a school project, Ryan Lutz and Andrew Brooks interviewed each veteran in his home on Sunday, November 15, 1998. The interviews were recorded on audio tape and transcribed to this document by James Lutz. Charles Dalton (and his brother Elliot Dalton) is interviewed on the DVD “Canadians on D-Day: The Juno Beach Centre”. Rolph Jackson is interviewed on the DVD “D-Day: Canada’s 24 Hours of Destiny” and in Lance Goddard’s related book “D-Day Juno Beach: Canada’s 24 Hours of Destiny”. Jack Martin is interviewed on the DVD “D-Day: Canada’s 24 Hours of Destiny” and in Lance Goddard’s related book “D-Day Juno Beach: Canada’s 24 Hours of Destiny”. What was your rank when you landed on D-Day? What was your first reaction when you heard you were going to land on June 6? What were the days like leading up to the landing on D-Day? What was it like and what were your feelings when you were coming in on the landing craft? How did everyone else feel? What was the atmosphere like during the battle? What was your first reaction when you started taking prisoners? What was your first reaction when you looked back on what you had just done, after the battle? What are your feelings at the present day? Do you have any other comments on D-Day and your experience? Rolph Jackson was a 23-year-old Lance Corporal on D-Day. He was in charge of a Bren Gun Section of B Company which was in the first wave, landing at 0812 hours. We figured it was the only way we could get home. We were awfully tired of being away from home. We’d come over in ’41 in the summer and the English got used to us and we got used to the English, but it was an awful lot of training. It was a job. We knew it was going to be tough. You people are not brought up with Canadian history, but we had our forefathers, our fathers’ generation’s reputation to live up to from World War I. And we did it. Let’s get it over with! When we first saw the beach, it was on the dark side of dawn. It was British war time which is two hours ahead of solar time. It was double daylight, if you follow me. You could see outlines against the dark side. The beaches were under bombardment. You could see the ships at sea, a massive flotilla, the most ships I’d ever seen. We landed while part of the bombardment was still going on. Many of us that survived felt it would have been better to land without the bombardment because the beaches were manned when we got there. We had rocket craft that had 1400 rockets. They fired them in batteries of 20, and they killed a lot of cows. Unfortunately a Yankee Thunderbolt [aircraft] was patrolling the beach and they took out one of their Thunderbolts. That was the first casualty we saw. Our landing craft had two sections of infantry, about 20 men, and a section of engineers. They were demolition engineers. We landed at the sea wall. I’ve seen the Yankee beaches and they were very shallow, but ours was very steep. I was – if you’ll pardon me – up to my balls in water. We hit the beach and it was a slaughterhouse. They cut us to ribbons. Of the 10 men in my section, 7 were dead and 2 of us were wounded. Two of us crossed the wall. In our platoon, there were 6 men left by 2 o’clock the next morning, 6 out of 36. I was hit in the hand in the water and knocked off my feet. I lost a lot buddies. I seen them go down. The sea was red with blood. Most of them went down in the water, and I think quite possibly drowned rather than was shot. We had to walk 25 or 30 yards in the water. How did we feel when we were on the beach? Fairly angry. We were carrying a lot of assault equipment. If you were carrying anything but a rifle, you didn’t make it. Was I scared? You didn’t think about it. We cleared one dugout. We presumed it was cleared – they didn’t come out after the 36 [hand grenade] went down there. German grenades were concussion, and ours were shrapnel. I have a piece of German grenade in my shoulder still. The doctor gave me some sulfa because I had been shot in the hand. We did what the Americans didn’t do. We had Dieppe for training. At Dieppe the soldiers stopped to help the wounded. We learned you can’t stop under fire because a moving target is harder to hit. We were told under no circumstances to stop and help the wounded. No way. Get in behind the enemy and take him out. Was I scared? I guess maybe we were. We didn’t think about it. That night I wasn’t looking forward to having to dig in with one hand. I saw the M.O. [Medical Officer] and he evacuates me because I have bones smashed. I spent most of the night getting back to the dressing station. I fell asleep against a stone wall and maybe got 3 hours sleep. Jack Martin was a 20-year-old Rifleman (private) on D-Day. 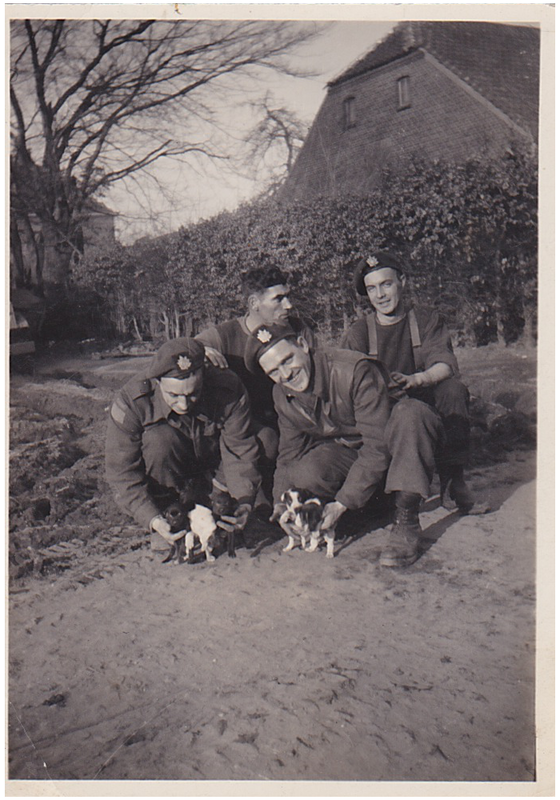 He was from Toronto, and his father and 4 brothers had all served in the QOR. 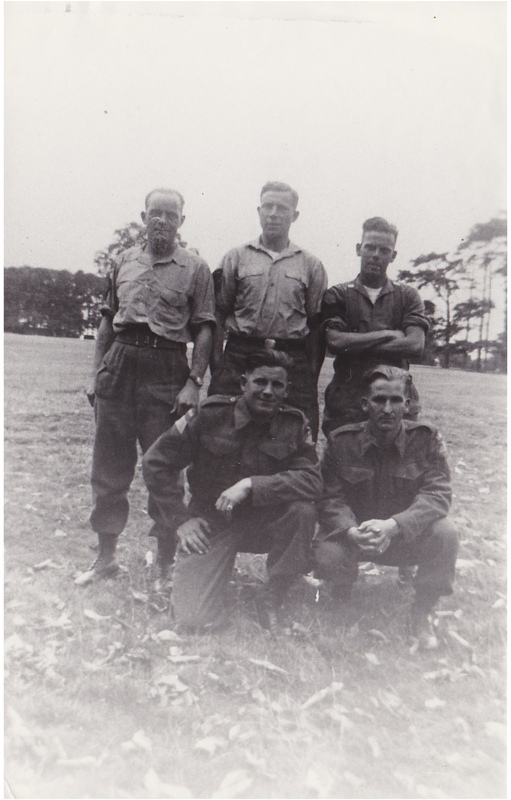 Rifleman Martin was with the mortars who landed with C Company in the second wave at 0830 hours. We were confined to barracks – that was C.B. – waterproofing the Bren Gun Carriers. We had scissors and were cutting each others’ hair. I got a beaver cut. I was on a Landing Craft Tank with the Bren Gun Carriers. I was lying on the gunwale looking onto the water for mines. This was all new to me . . . I was just a kid of 20! I never gave any notice to anybody else. I was just looking after this guy [meaning himself]. When the ramp went down, we landed on dry sand and we ran right off. There was a captain giving us directions and he had blood streaming down his face. That scared me more than anything else. We were ordered to run right up to the wall for protection. I ran like hell. One of the other landing craft had flipped in the water. I couldn’t see what happened to the men because we were told we couldn’t stop on the beach. I thought it was a great accomplishment that we had gotten that far. It was hectic! This was our first time in battle. It means something if it’s permanent when they hit you. We were the mortars, so we didn’t get too near the enemy. We had to support the infantry. We were near the self-propelled guns which were firing at a German 88 [88mm gun]. An SP was hit, and it was loaded with ammo, so it blew sky-high. It was the worst explosion I ever heard, and I served from D-Day through to VE Day. The gun from the SP came whizzing through the air at me and right over our heads. It sounded like a freight train. I was tired. I got into my slit trench and went to sleep. We were in a barnyard, and during the night a German staff car pulled into the barnyard. The men in it went to sleep. In the morning, some of our soldiers woke the Germans – there were 2 officers and an NCO – and they were really surprised when we woke them up! It was something to have lived through. I’m one of the few left. We were all volunteers, you know. I have no regrets. I had lots of great friends. Charles Dalton died in 1999 – see below for his obituary from the Queen’s Own Rifles website (qor.com). Rolph Jackson died in 2006 – see below for his obituary from the Queen’s Own Rifles website (qor.com). Jack Martin died in 2016. Colonel Charles Osborne Dalton, the last surviving D-Day company commander of The Queen’s Own Rifles of Canada who was recognized for his gallantry with the Distinquished Service Order by Field Marshall Bernard Montgomery, has died aged 88. As Company Commander of B Company, then-Major Dalton, along with his younger brother, Elliot – who commanded A Company – led the two front line assault battalions on Juno Beach for The Queen’s Own Rifles – Canada’s oldest continuously serving infantry regiment. The brothers, who had developed a strong bond, were known in the Regiment as “Mark I and Mark II” to distinguish the elder from the younger brother. At his brother Elliot’s funeral service in 1994, Col. Dalton said as D-Day approached and he began to realize he may never see his brother again, he tried to come up with some parting words. As the landing craft ramp dropped in front of Bernieres-sur-Mer, Major Dalton turned to his men shouting, “Follow me!”, as they plunged into two to three metres of water, trudging their way to shore. As they made for the seawall, Maj. Dalton turned back to see his men laying on the sand. “I thought they had gone to ground for cover, then realized they’d been hit,” he remembered. The company had landed directly in front of a concrete strong point and were immediately met with fierce machine-gun fire. Almost half of the company was lost in the initial dash across the beach. As he and his men tried to capture a German gun emplacement, Maj. Dalton was shot in the head, the bullet ripping off his helmet and peeling off his scalp. Despite severe wounds, Maj. Dalton continued to lead his men across the beach and was personally instrumental in knocking out one of the pillboxes. “With blood pouring down the side of his face, he still encouraged us to continue on,” said Joe Oggy, a retired Corporal, who was under Maj. Dalton’s command at the time. His greatest fear, he once said, was not being wounded or killed but failing to lead his men. The citation of the DSO read, in part: “By this officer’s example of leadership and bravery, and his coolness in the face of stiff opposition, the enemy fortified position was quickly overrun, and the company which followed in the landing on the beach suffered no casualties from the beach defences. 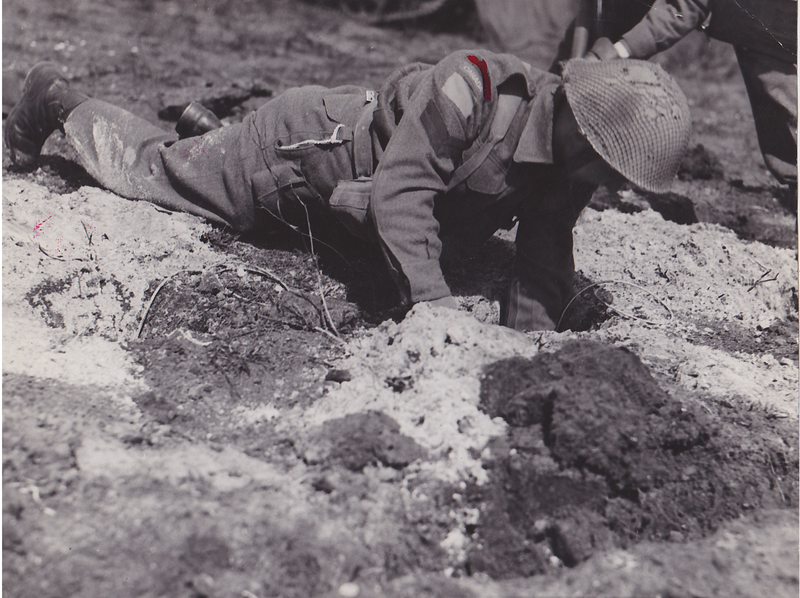 “The casualties were the heaviest suffered by any Canadian unit that day. In the end, 56 other ranks had been killed in action; seven died of wounds. Six officers and 69 other ranks had been wounded. As Maj. Dalton was evacuated to a hospital in England, his brother Elliot was mistakenly told that Charles had been killed. “While I was sad to hear my brother had died, I didn’t really have time to grieve, as we were still fairly busy,” Elliot Dalton recalled. However, Elliot was wounded a few days later and sent to the same hospital as his brother. As the nurse wheeled Elliot to the bed marked Maj. Dalton, he noticed a patient lay there with the sheet pulled over his head. During his recuperation, Maj. Dalton had the honour of meeting Queen Elizabeth, now Queen Elizabeth the Queen Mother. By August, Maj. Charles Dalton had recuperated well enough to return to combat with the Queen’s Own and served through the Channel Ports campaign as second-in-command of the Regiment during the fighting of the Scheldt in Belgium in the fall of 1944. He was promoted to Lieutenant-Colonel, and appointed to command the Non-Commissioned Officers School at Ravenstein, Holland. He returned to Canada in March, 1945, to command the Small Arms School at Long Branch, Ont., and retired from active service in September, 1945. From 1968 – 1975 he was the Honorary Colonel of The Queen’s Own Rifles of Canada. Born in Toronto, Col. Dalton enlisted with The Queen’s Own Rifles Cadet Company in 1925 and the 2nd Battalion Militia a year later at the age of 16. He volunteered for active service and was sent to England in March, 1940, as an instructor to the Canadian Infantry Training Unit. 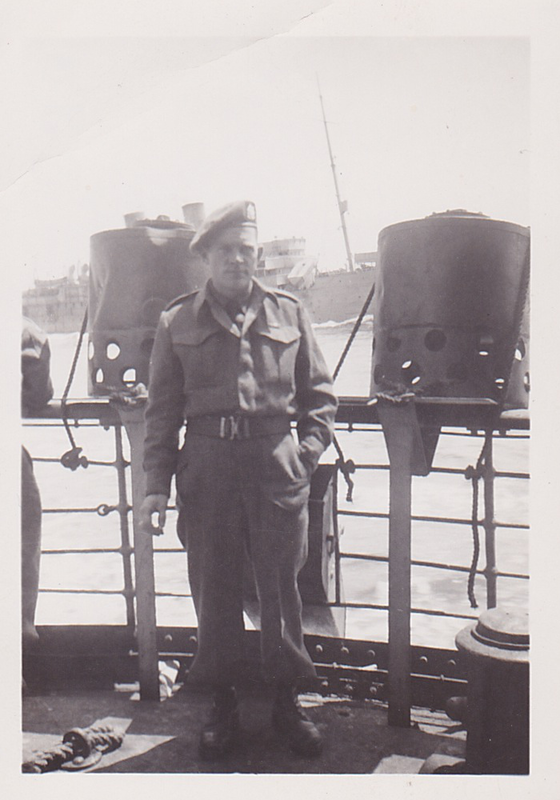 In 1943, he rejoined the Regiment and was soon promoted to Major and made Officer Commanding B Company. “He was fantastic. He was a buddy. His brother was the same way, very down to earth. We would follow him to hell if we had to. His friendliness and rank meant nothing to him as far as we were concerned, he was a buddy and we respected him. He never talked as an officer ordering this and that, he and his brother were good leaders.” Cpl. Oggy said. His command responsibilities followed him to civilian life. After the war he joined Canadian Breweries Ltd. as Assistant to the Vice-President of Sales and was appointed Sales Manager of the Carling Breweries Ltd. in 1946. He was made President of Carling Breweries Ltd. in 1951. He was appointed Executive Vice-President Canadian Operations, Canadian Breweries Ltd. in 1964 and Executive Vice-President of Canadian Breweries Ltd. in 1965. He also became Vice-President of Canadian Executive Overseas from 1969 to 1971. He was a popular and much sought after-dinner speaker. “He was a reserved person. And yet he was amazingly articulate and spoke exceedingly well and he was asked to speak a great deal because he could express and talk about the war with a light touch and good humour but didn’t treat it lightly,” said Mr. Danson, who served as a Liberal Minister of Defence. During his recuperation from a head wound, Colonel Charles Osborne Dalton had the honour of meeting Queen Elizabeth, now Queen Elizabeth the Queen Mother. Rolph Jackson was born April 6, 1921, in Toronto, a ninth generation descendant of Loyalist settlers from the U.S. Originally, the Jackson family came from County Armagh in Northern Ireland. His mother died when he was age six and his sister Lenore, two. The family struggled as their Dad had work only occasionally, especially during the lean Depression years. Rolph was sent to live with his uncle at age nine in 1930 on a farm in Grey County, near Holland Centre. His sister went to live with an aunt in the West. Life on the farm in the 1930’s was difficult and the harsh environment in which he was raised significantly shaped his life. Rolph moved back to Toronto in 1937 to be with his father and to look for work. 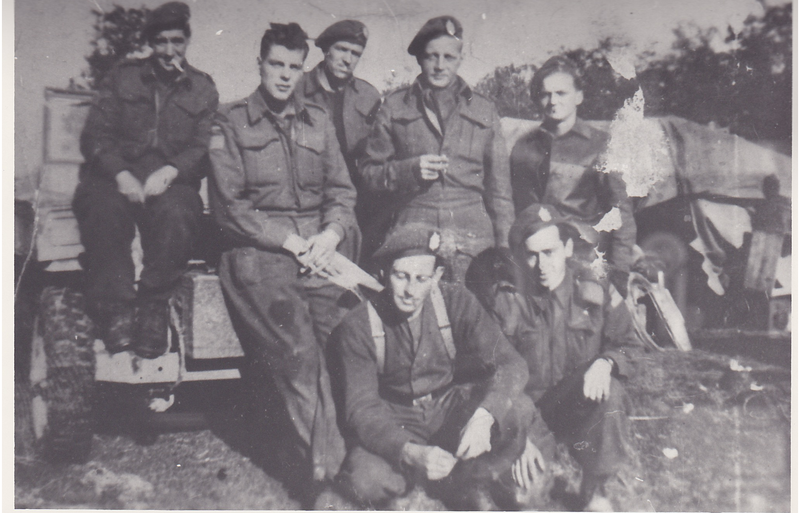 Rolph joined The Queen’s Own Rifles militia in December 1939, shortly after WW11 began. When the Third Division was mobilized for overseas service, he “went active” on 5 June, 1940, at age 19, enlisting in Baker Company of the 1st Battalion. He trained with them in Newfoundland and Sussex, N.B. prior to departing for England in the summer of 1941. During embarkation leave, Rolph came back to Toronto and had a visit with Olive Lipski and family. She wrote him faithfully and he wrote back when he could. On D-Day, his Baker Company was especially hard-hit, only Rolph and two others (Doug Hester and Bob Nicol) in his section survived. Rolph was wounded in the hand and after recovery remained in England until the end of the war. Following Rolph’s return, he and Olive were married on 9 October, 1945, at Redeemer Lutheran Church, Toronto. Their daughter Chrystal was born in late 1947 and they soon decided they needed more room. They bought their first house: an “ugly four room” one and lived there from 1948 to 1952. After working at a variety of temporary jobs, Rolph got work at The Toronto Star in 1950 as a pressman and he worked there until retirement. The Jackson family moved to a larger six-room bungalow in Scarborough (Pharmacy and Eglinton-St. Clair) just one block away from a public school that Chrystal attended beginning that Fall. Olive and Rolph lived there from 1952 until 1966 when Chrystal graduated from Grade 13 and they moved to the house on Roosevelt in East York. It was reasonably close to downtown for work for Rolph and a good community to live in. The family attended Emmanuel Lutheran for a number of years in the 1950’s and early ’60’s where Olive taught Sunday School. She was also involved with the women’s group and helped with Christmas pageants. They had a lot of fun and liked to go to dances, shows and played cards a lot. Olive and Rolph were members of RCL Branch 344 from the 1970’s, when they met in a building on Elm Street (long since demolished), before moving to its current Lakeshore Avenue location. They also took many interesting vacations: to the eastern United States, California, Mexico, Caribbean, Hawaii and to Europe four times, including memorial trips to Normandy as well as tours to Greece and the former Yugoslavia. Rolph loved the out-of-doors. For many years he would take a friend and go canoeing and fishing in Algonquin Park, even into his 70’s when his friends weren’t able to go any longer. After his wife died in 2001, Rolph lived as a widower in the house with his black cat, Midnight. His health declined and he eventually sold the house at 53 Roosevelt Road in 2005. He moved into Sunnybrook Hospital, Hees Wing, where he resided at the time of his death, just three days after the 62nd anniversary of D-Day. This document may be cited as: Lutz, Ryan and Andrew Brooks. 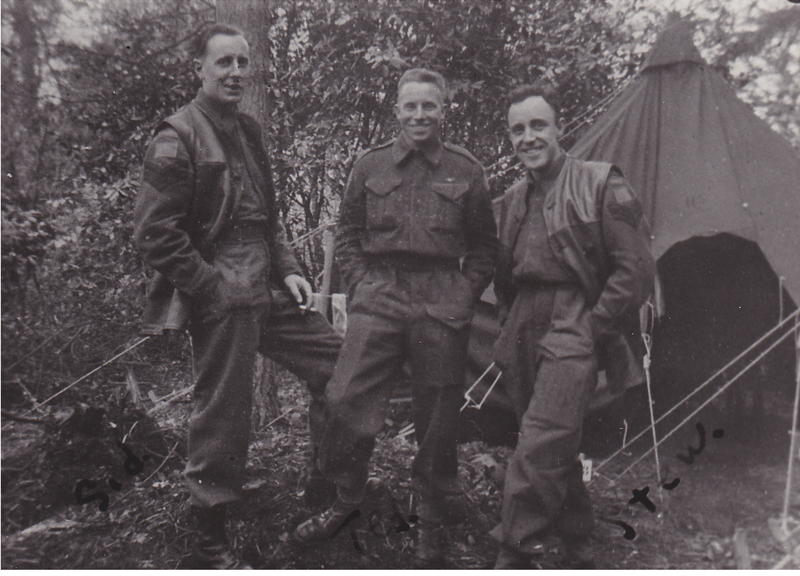 Interviews with Three D-Day Veterans of The Queen’s Own Rifles of Canada. Toronto, 1998.